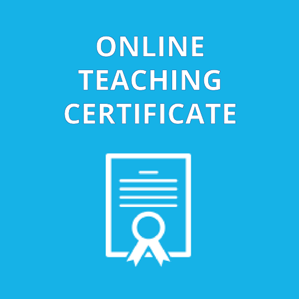 Online Teaching Certificate Programs: Which Program is Right For Me? Online Teaching Certificate Programs: Which Program Is Right For You? Ready to advance your knowledge and skills? We can help you choose the right program. The OLC Institute for Professional Development offers two unique certificate programs that can help you develop and advance your professional practice in the online classroom. Use the chart below to help you decide which program is right for you at this time. This program prepares educators to teach and improve online courses using the OLC Pillars of Quality in Online Education: learning effectiveness, scale, faculty and student satisfaction, and access. This program is designed to help educators fine-tune existing online courses and degree programs in order to have a positive impact on student learning. Participants conduct a critical analysis of their own course to determine how close, or far, they are from the best practices described in the OSCQR Course Design Review and the Quality Course Teaching and Instructional Practice (QCTIP) scorecards. This analysis becomes the foundation and framework that each individual participant uses as they explore topics in six units of study. This Certificate is a 12-week workshop consisting of various modules allowing participants to deeply immerse themselves in the presented topic. Each module has a “kick off” live session and culminates in a project which is presented to and reviewed by the facilitator and by peers. Getting Started – Utilize the OSCQR and QCTIP scorecards to complete a course design review for a course that you teach in order to identify strong aspects, as well as areas for improvement. Objectives and Assessments – Broaden your knowledge of various assessment techniques (formative and summative) for measuring individual and group student performance, starting with examining program and course learning objectives to ensure they are measurable. Active Learning Strategies – Discuss the pros and cons of active learning, as well as a broad range of active learning strategies including (but not limited to) collaborative learning, problem-based learning, inductive learning, etc. Multimedia and Social Media with Accessibility Considerations – Explore popular forms of multimedia/social media tools to promote student engagement and build connections within a learning community. Delve into common accessibility standards as related to the use of such media. Open Unit – To strive to make this program as worthwhile and personal as possible for the cohort of individuals enrolled, the participants decide what they want to study, and that content is then designed and shared. Full Circle – Brings the program full circle by reflecting on improvements made to a course by again using the lens of the OSCQR and QCTIP. Note: Participants must have an online or blended course that can be revised or developed that is at least two weeks in duration. Educators, administrators, or institutional leaders who want to become more effective online/digital teaching & learning professionals. Online faculty who wish to critically analyze and improve their online courses by incorporating active learning strategies, multimedia and social media components, accessibility standards, and stronger assessment practices. At the end of this program, participants will have developed and/or revised a complete online or blended course based on current research and best practices and will be prepared to develop new courses. Upon successful completion of this program, participants will be awarded an Online Teaching Certificate and a digital badge. At the end of this program, participants will apply best practices for online/ blended teaching and learning, and will take away newly created assets that can be immediately incorporated into their courses. Upon successful completion of this program, participants will be awarded an Advanced Online Teaching Certificate and a digital badge. Still not sure which program is right for you? Contact institute@onlinelearning-c.org and one of our staff members will answer your questions. I undertook the OLC Teaching Certification during which I palpably grew. I felt it helped me design not only my online course, but also to improve my face-to-face courses. I learned to clearly see the link between learning objectives, learning activities, and assessments. I followed this up a year later with the Advanced Online Teaching Certificate since I had now developed and run my first online course. I was ready to improve it. I learned about increasing student engagement and interactivity in this course, and I learned to improve the accessibility of my course. I think it is a much better course now, and I am proud of it.